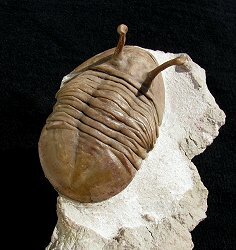 Size: Trilobite is 3.3" long, NOT counting the eyes! This is a killer specimen of a classic trilobite This is a beautiful example of Asaphus (Neoasaphus) kowalewskii from the Ordovician of Russia. This strange trilobite is quite inflated and nicely preserved in an outstretched position. The long, stalked eyes have been prepared in a free-standing manner and are wonderfully displayed. The thick, caramel-colored exoskeleton contrasts beautifully with the light-colored limestone. The HUGE bug (over three inches long!) is extremely well showcased on the large, natural plate of limestone. This is a very impressive example of one of everybody's favorite trilobites.